Chip Reprograms Cells To Speed Healing In Mice : Shots - Health News This device shoots new genetic code into cells to make them change their purpose. 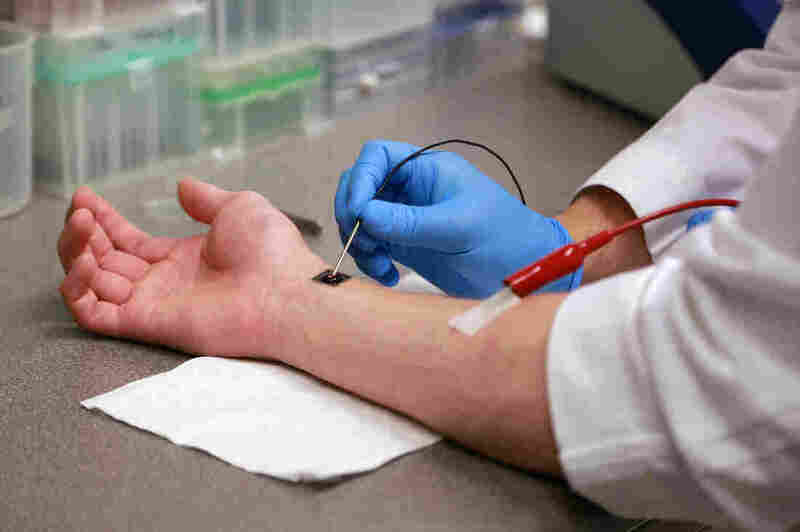 Researchers say the chip could someday be used to treat injuries in humans. But they've got a long, long way to go. The chip has not been tested in humans, but it has been used to heal wounds in mice. Scientists have created an electronic wafer that reprogrammed damaged skin cells on a mouse's leg to grow new blood vessels and help a wound heal. One day, creator Chandan Sen hopes, it could be used to be used to treat wounds on humans. But that day is a long way off — as are many other regeneration technologies in the works. Like Sen, some scientists have begun trying to directly reprogram one cell type into another for healing, while others are attempting to build organs or tissues from stem cells and organ-shaped scaffolding. But other scientists have greeted Sen's mouse experiment, published in Nature Nanotechnology on Monday, with extreme skepticism. "My impression is that there's a lot of hyperbole here," says Sean Morrison, a stem cell researcher at the University of Texas Southwestern Medical Center. "The idea you can [reprogram] a limited number of cells in the skin and improve blood flow to an entire limb – I think it's a pretty fantastic claim. I find it hard to believe." When the device is placed on live skin and activated, it sends a small electrical pulse onto the skin cells' membrane, which opens a tiny window on the cell surface. "It's about 2 percent of the cell membrane," says Sen, who is a researcher in regenerative medicine at Ohio State University. Then, using a microscopic chute, the chip shoots new genetic code through that window and into the cell where it can begin reprogramming the cell for a new fate. Sen says the whole process takes less than 0.1 seconds and can reprogram the cells resting underneath the device, which is about the size of a big toenail. The best part is that it's able to successfully deliver its genetic payload almost 100 percent of the time, he says. "No other gene delivery technique can deliver over 98 percent efficiency. That is our triumph." 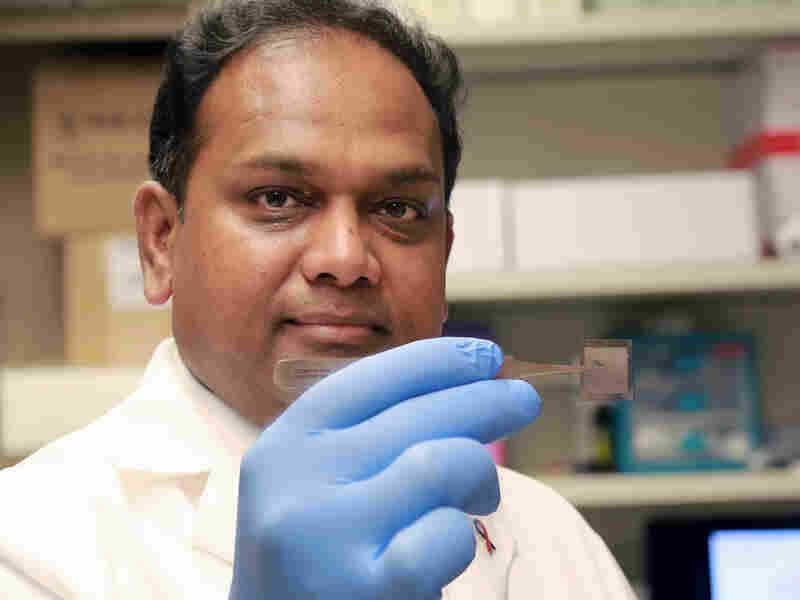 Chandan Sen, a researcher at Ohio State University, holds a chip his lab created that has reprogrammed cells in mice. To test the device's healing capabilities, Sen and his colleagues took a few mice with damaged leg arteries and placed the chip on the skin near the damaged artery. That reprogrammed a centimeter or two of skin to turn into blood vessel cells. Sen says the cells that received the reprogramming genes actually started replicating the reprogramming code that the researchers originally inserted in the chip, repackaging it and sending it out to other nearby cells. And that initiated the growth of a new network of blood vessels in the leg that replaced the function of the original, damaged artery, the researchers say. "Not only did we make new cells, but those cells reorganized to make functional blood vessels that plumb with the existing vasculature and carry blood," Sen says. That was enough for the leg to fully recover. Injured mice that didn't get the chip never healed. When the researchers used the chip on healthy legs, no new blood vessels formed. Sen says because injured mouse legs were was able to incorporate the chip's reprogramming code into the ongoing attempt to heal. That idea hasn't quite been accepted by other researchers, however. "It's just a hand waving argument," Morrison says. "It could be true, but there's no evidence that reprogramming works differently in an injured tissue versus a non-injured tissue." What's more, the role of exosomes, the vesicles that supposedly transmit the reprogramming command to other cells, has been contentious in medical science. "There are all manners of claims of these vesicles. It's not clear what these things are, and if it's a real biological process or if it's debris," Morrison says. "In my lab, we would want to do a lot more characterization of these exosomes before we make any claims like this." Sen says that the theory that introduced reprogramming code from the chip or any other gene delivery method does need more work, but he isn't deterred by the criticism. "This clearly is a new conceptual development, and skepticism is understandable," he says. But he is steadfast in his confidence about the role of reprogrammed exosomes. When the researchers extracted the vesicles and injected them into skin cells in the lab, Sen says those cells converted into blood vessel cells in the petri dish. "I believe this is definitive evidence supporting that [these exosomes] may induce cell conversion." Even if the device works as well as Sen and his colleagues hope it does, they only tested it on mice. Repairing deeper injuries, like vital organ damage, would also require inserting the chip into the body to reach the wound site. It has a long way to go before it can ever be considered for use on humans. Right now, scientists can only directly reprogram adult cells into a limited selection of other cell types like muscle, neurons and blood vessel cells. It'll be many years before scientists understand how to reprogram one cell type to become part of any of our other, many tissues. Still, Morrison says the chip is an interesting bit of technology. "It's a cool idea, being able to release [genetic code] through nano channels," he says. "There may be applications where that's advantageous in some way in the future."